Your kids will adore bath time when they also get to go on a deep sea adventure with these fun Sea Creatures Bath Squirters. Some kids hate baths but these cute and fun toys will make them look forward to the tub and a chance to fill and squirt. 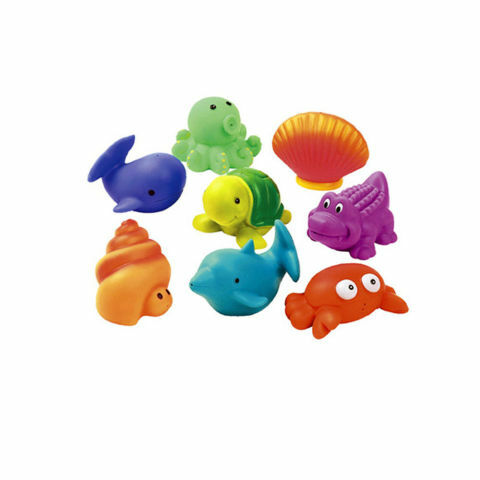 The set of eight squirters includes a sea turtle, a crab, an octopus, a whale, a dolphin, a clam, a sea snail, and a crocodile. Enough to keep the kids from getting bored. They are nontoxic, phthalate-free, with no small parts for safe play. Rinse regularly with mouthwash to keep them clean and mold-free. For more information or to order, click here. Women And Cats Rule! Get Used To It!